So I visited the Sea Slug forum and they told me that the Elysia Viridis Sea Slug mows down bryopsis. The only problem is that I can't seem to find anyone who sells this sea slug. It is related to the lettuce nudibranch, but much much more effective in removing that nasty weed. Does anybody know of a source for these critters? Joe_Bui you are correct about the lettuce slug I have over 100 of them and they do not eat anything. I even have some about 4" long. They are multiplying like crazy. They will sit on algae and they may even sleep on it but if you are waiting for them to eat it, forget it. I have a ton of bryopsis in my tank. Recently finished cycling the tank and turned on all my halides. Most of the bryopsis turned into these slimey gooey yellow snot strands. Is that reproduction or death? It seems to be regrowing little shoots all over the tank again. Kinda frustrating. I have never fed any food since I only have a lawnmower blenny. Running a euroreef skimmer and a macroalgae fuge (gracillaria and ulva). RODI topoff and Instant Ocean salt mix. Nutrients are definitely a net export. But this stuff is spreading. OK, it may make you shutter, but I took out the rock that first showed hair and did a chlorox bath and scrub. I rinsed VERY well and did a few fresh water soaks. The last I used a heavy dose of de-chlorinator and put it back in the tank> Nothing happened to fish or corals. I have noticed that most who have severe outbreaks have huge flows. The flows spread the algae faster so I think flow is a great contributor. If one tries to pick it, it gets worse. I don't think picking makes much sense...unless it's done by a Tang. Fuge competition, Tang, UV sterilizer (for waterborn part. ), reduced direct flow, and quick (and in my case...insane) action are my suggestions. 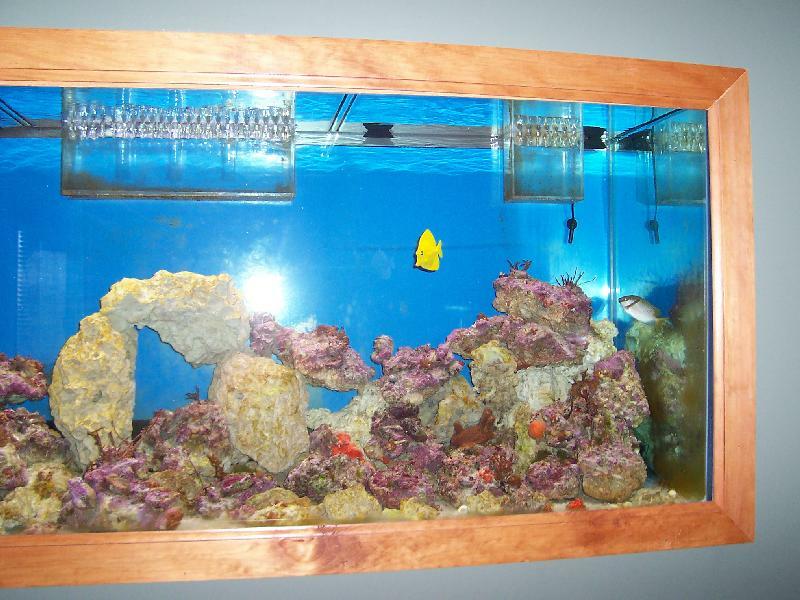 Current Tank Info: 150g 1/2" cast acrylic center OF with 60g custom sump/fuge. Mag18, AquaC 180 skim, 2ea Tunze 1600 cir pumps with elct. controller, UV, 840w VHO, custom moonlight, 5 fish, 50 assorted LPS/Softies. OK my 2 cents. This thread looks to be dwindling but it is a great thread with a subject we all will encounter eventually. By my own hand I created a hair algae problem. I had placed a piece of foam under my pump to quiet it down. It slowly released phosphates into the water. I also was trying to trap a Mantis Shrimp and left my bait ( a hunk of shrimp) in too long. Suddenly HAIR ALGAE. The outbreak was nothing like the pics others had sent up but having a tank years ago that was overrun with it I knew what lay around the corner for me. He sent my home with 2 Rabbitfish, 6 Conch, and a Yellow Tang that I wanted because it was pretty. Also in my tank already are 15 turbosnails a brittle star and tens of thousands of unidentified critters. My cleanup crew was in place. I also have a healthy growth of calurpa in my fuge and dropped one of the wife kneehighs loaded with a phosphate remover in my main overflow. I can tell you honestly that the Rabbitfish and Conch WILL eat every bit of algae in your tank. One note: They didn't seem to like the hair algae if it is too long so I removed rocks with the longest growth on them, scrubbed them with a brush and rinsed them under tank water that I discarded afterward. I never really let it get out of hand but as you can see in the pic that crew mowed down to the stalk all algae in there. I think that's the key with the rabbit fish. The algae can not be too long or they will not eat it. I've brushed down all my rock and just got the exact fish you have in my tank. I am hoping that he will polish off the little nubs of algae as it starts to grow. Yea if its about 1/8 inch or shorter it will never get a hold in there again. I have seen them pull out hunks of the longer stuff but its rare. My Yelllow tang is also great at picking at the shorter stuff. Cover the Bryopsis spot COMPLETELY and it's dead in a few days. Leave your lights on, but deprive the algae of what it needs the most to live. Since my last post here in January I found out that the lettuce slugs that keep multiplying in my reef eat nothing but bryopsis. Who would have thought. Of course I have no bryopsis so the things do not get very large. I sent some to a researcher who studys these slugs and she sent me some bryopsis. In a seperate tank (I am not crazy) I put some slugs and they sucked all the juice out of the bryopsis and it turned into slime. A few slugs will not do it but if you can get a large one and get it to spawn you will have hundreds. They only get about 1/2" long without bryopsis then I think they die. With bryopsis they get about three inches. They sell them here in NY in "Fish Town " for about $7.00. The only problem with them is as babies you have to screen intakes for powerheads. Here is a picture of one of my babies. If possible, I would like to purchase some of your elysia crispata. Care to share? Joe I wish I had enough slugs for everyone that wants them but unfortunately that is not the case. I have no bryopsis so they do not grow. I used to have over 100 but I gave many away and sold a bunch to stores, I just counted twenty left. I would like to keep these but I think they will disappear soon. When all of them are gone I can unscreen my powerheads which I have to clean every two days. I guess they do not sell them in California. this stuff all of a sudden appeared. it was pretty small so i didnt think much of it. then with in a week or so i took off covering my entire ricordia rock, and then began showing up else where. also other more typical hair algaes showed up as well. i have been removing it via toothbrush and syphon but it comes back with in a few weeks. i am going to try to aquire a few fish to help me. i was thinking a kole tang, and rabbit fish, then later a sailfin tang. one day the strength of men will fail...but that is not this day.......THIS DAY WE FIGHT!!! Current Tank Info: 125g mixed LPS, soft coral display. 165lbs of mixed fiji, tonga, and lalo rock. 440watts of VHO lighting. 30g sump with euro-reef CS6-2 skimmer. 60g refugium with LR and various macro algae's. That's Bryopsis for sure. Good luck. It's a tough battle. 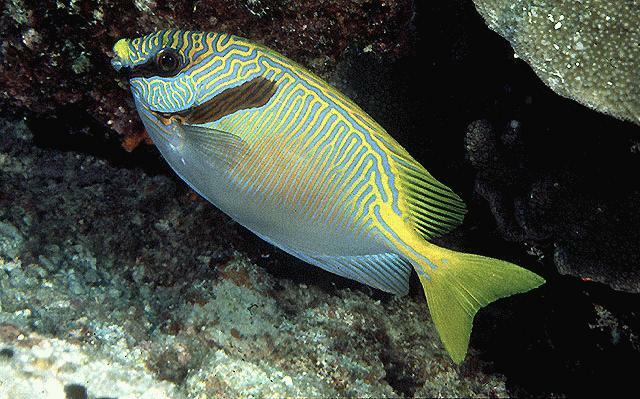 You can try the Fiji Rabbitfish (Siganus uspi). It's the only fish I've ever seen touch the stuff. well i have just read some horror stories of foxfaces terrorizing tanks. picking at corals eating polyps and so forth, not to mention some of the people who were stuck with there venomus spines. i think ill stick with the tangs. kole and a sailfin, or purple and a sailfin. have'nt decided yet. i also just adjusted my photoperiod to help with the killing of unwanted algae. it may be winning the battle for now, but i intend to win the war. little does it now how persistant i can be. I can assure you that the tangs you've mentioned will NOT eat Bryopsis algae. Even Siganus uspi is hit or miss. If you can remove the rock with the algae, I would, even if it means getting rid of the coral. Nothing short of a nuclear bomb will permanently kill that stuff, and I'm not even sure about that. i know they wont eat the bryopsis in the picture i posted, but i have heard alot of reports saying they will graze on the more common hair algae. im not an expert on the subject, but i have had tangs before and in my FO they wiped all the algae out of my tank including the cyno. i think like you said its hit or miss. Even Siganus uspi is hit or miss. I was just going to ask about that Thanks for the information! Kole tang will not touch it. Lawnmower Blenny will not touch it. I hear that Bali Slime Monster eats it. But for me,Phosban is the key! Managed to clean out a few nasty patches recently. What I did was to pick some seashells on a local beach and placing them over the patch for 2 weeks. Some of the shells slipped from their position after about a week exposing the remains of the Bryopsis and I cought the tangs eating the remains. This also happens if you squint it with boiling water. I guess it's because the algea is actually dead or perhaps it tastes better. I no longer have bryopsis in my tank. Went from a plague to nothing pretty quickly. Month of heavy skimming and no feeding. Only fish was a lawnmower blenny. My pod population grew to monster proportions. Even during the day, you could see hundreds of amphipods in the bryopsis. They ate every last scrap. And now you can't find any bryopsis or any pods in the tank at all. So remove all the fish and the little guys will take care of it?